Pianos, Organs, Rhodes and Clavs To Go! When it comes to a gigging keyboard, do you reach for the trusty pianos, organs, Rhodes and Wurli patches every time? Would you prefer to have 88 keys to play with, than 800 sounds you'll never use? Would you rather look at a cool vacuum tube than a nerdy LCD screen? If you answered "yes, yes, and yes," then you'll probably be a big fan of the Korg SV-1 digital piano. The SV-1 feels more like a musical instrument than a computer, and it's here to deliver a grand total of 36 killer pianos, electric pianos, clavs, and organs, along with a selection of vintage amp models, reverbs, and other effects, all with a supremely playable, fully-weighted RH3 keybed. "SV" stands for "Stage Vintage," and the Korg SV-1's vintage-instrument vibe is apparent before you even hear it. The curved case is clearly built to stand up to the rigors of live performance (and turn a few heads in the process). Flip the substantial power toggle and watch as amber lights blink to life on the beveled control panel. Turn chunky, clicking knobs to select and tweak your sound, or punch eight fat buttons to access your favorites. The controls are a breeze to operate, with nearly every function accessible via a dedicated knob -- ideal for live performance. 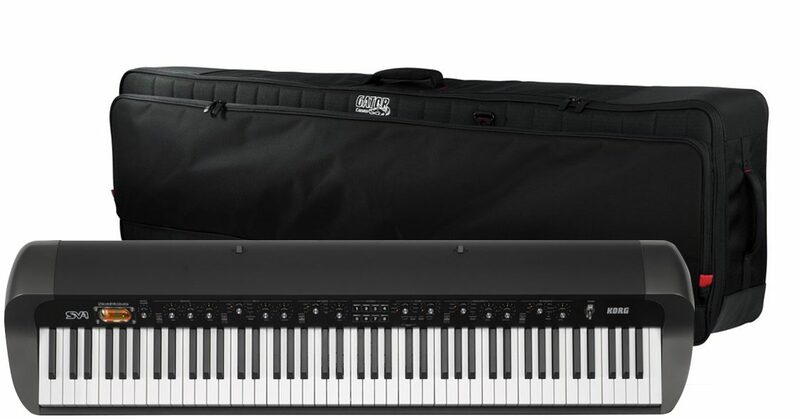 The keyboard itself utilizes Korg's fully-weighted RH3 graded hammer-action keybed (just like the one found on the Korg M-50), and you can adjust its sensitivity to one of eight curves by clicking the dedicated Touch button. Touch-sensitivity is memorized when you save a favorite sound. There's an included damper pedal, and a full three pedal inputs mean you can also hook up sostenuto and soft pedals of a real piano. It's clear that Korg has taken every care to approximate the real deal in the SV-1. The SV-1 may not be a time machine, but it's the next best thing for a keyboardist looking to transport their audience back to the classic sounds of the 60s, 70s, and 80s. You'll find loads of Rhodes and Wurlitzers, plenty more electric/electro-mechanical pianos, detailed acoustic pianos (including an impressive upright), indispensable pop piano/pad layers, Hohner Clavinets, and Hammond, Lowrey and Farfisa organs. Click the dial over to "Other" to find tasty novelties like Mellotron-esque violins, a 70s disco "Solina String Ensemble" homage, the obligatory synth choir, and even a couple of iconic 80s pop polysynths. On the acoustic pianos and electro-mechanical instruments, Korg's RX (Real eXperience) Technology sound generator goes beyond multisampling to include subtle imperfections that accompany the notes: the thunk of a damper pedal, clicking keys, snapping tines. You can adjust these RX effects independently, depending on just how "vintage" you want your instrument to sound. Easily switch between a pristine $60,000 concert grand to a trashed-out, ill-behaved suitcase piano that you picked up at a yard sale. Vintage electric piano sounds go hand-in-hand with period-accurate effects and amps. But typical amp simulations don't include a power amp circuit -- and the sound of a real tube amplifier depends on the varying impedance created by a power amp driving a speaker. So Korg built the SV-1's Valve Reactor as an actual low-wattage power amp circuit, complete with the real 12AX7 vacuum tube built into the front panel. Sonically, this translates into the unmistakable warmth and growl of a tube amp through your choice of speaker cabinets. Like the effect chain in a classic instrument amplifier, the SV-1 has a three-band equalizer section; stompbox "pre" effects simulator with compressor, booster, univibe, vibrato, tremolo, and Vox wah; and post-amp modulation section with chorus, phaser, flanger, and rotary speaker effects. There are also six types of reverb and delay, plus two limiters to keep your levels under control. And you can bypass any or all of these stages, to shape your tone to your liking. There's more to the SV-1 than meets the eye. Connect your SV-1's USB port to your Mac or PC to back up and edit all your sounds and effects with Korg's SV-1 Editor/Librarian software. Graphic-based and painless to use, this free software extends the SV-1 experience to your computer to make digging into sounds and effects fun and rewarding. Access parameters beyond what you'll find on the SV-1's front panel to develop your own signature sounds. If you need more than 8 spots to save your favorite sounds, you can now override any of the 36 presets with sounds of your creation, or load new sound banks that Korg releases through their website. Think about it: how many sounds do you really want to drag with you on a gig? If acoustic and electric pianos are where it's at for your live rig, treat yourself to the Korg SV-1 and simplify your setup while upgrading your sound. zZounds is an authorized dealer of Korg products. Stage. Vintage. Piano. The name pretty much says it all. The SV-1 contains the hippest, most in-demand and soul-satisfying keyboard sounds ever collected in a single instrument. Decades of electro-mechanical, transistorized, tape-driven, analog, and digital legends are joined by a collection of rich acoustic pianos, all reproduced with stunning realism. But the SV-1 is about much more than excellent sound; the SV-1 re-creates the look, the feel, and visceral pleasure of performing on a vintage instrument. Crafted using Korg's RX (Real eXperience) Technology; each sound is a detailed and authentic re-creation, accurately capturing the full range of expression and dynamics of the original. The snap of the tine, the release of the hammer, the click of the contacts--every element has been preserved. By isolating these sonic components, the RX engine allows you to create a sonic signature from showroom-shiny to road-ravaged; adding just the right amount to suit your individual taste. But for Korg, even that is not enough. The SV-1 also recreates the effect pedals and studio processing that gave these sounds their original luster. The proven, tube-driven (12AX7) Valve Reactor circuit adds warmth and realism to period-accurate amplifier models. Together, the three-band EQ, Pre-FX, Modulation FX and Reverb/Delay add yet another dimension of authenticity to your playing. Designed with performance in mind, the SV-1 is a pleasure to play. Once you try it, you'll understand what all the excitement is about. The RH3 Real Weighted Hammer Action is the finest keybed Korg offers, with a solid, responsive feel that inspires confidence. Forget menus. Never mind banks and programs. Stop staring at displays. With the SV-1, the entire front panel is always live, using clearly labeled knobs to dial up just the sound you are looking for. Saving your eight Favorite settings for quick recall is as easy as saving a station on your car radio. Best of all, the Korg SV-1 provides an economical, reliable, portable, and maintenance-free alternative to collecting and maintaining a stable of vintage instruments. The cabinet styling (and optional chrome stand) clearly defines the SV-1 as an instrument that was made to be played; providing a retro-chic appearance that reflects the pulse and heart of the original instruments. You know the 36 sounds in the SV-1 by heart; each one is an old friend. Rediscover hit-making vintage electric pianos, funky clavs, classic and cult-fave organs, string machines and, of course, pianos. The SV-1 serves up breathtaking grands, a real-deal upright, plus hall-of-fame electronic contenders. And the SV-1 doesn't just serve plain vanilla; you'll find multiple, signature variations of many classic instruments to inspire your performance. Each category of instrument starts with the essential classics and then moves beyond what other products offer, going into some rare and unique instruments that were the part of the soundtrack of their eras. So the electric pianos start with several seven-way, velocity switched "tine" versions, continue through the classic "reed" based model and then into a vintage analog "electra" instrument (all from American manufacturers), as well as two different Japanese mid-80's digital classics. The acoustic pianos include three-way stereo versions of both German and Japanese grand piano giants, a more intimate upright piano, a much-needed mono piano for small gigs, a late '70s-mid 80's Japanese electro-acoustic variation, Korg's signature and rocking SG-1D, plus some blended sounds. Organs include three variations of the classic tonewheel model, plus the most famous British and Italian combo organs, along with the first known offering of a signature American tube-driven console organ. Clavs include four variations of the tonal settings plus a related keyboard from the same manufacturer that used a plucked-reed mechanism for a unique and intimate sound. Add in real, tape-based, and analog strings; choir; and a couple of fat analog synth sounds and you have an incredibly versatile palette of sounds to perform with. Each of the core keyboards has been accurately sampled including tine, key-off, damper and hammer noises at different velocities. Tonewheel organs include the much-needed leakage and adjustable key-click. They even sampled piano cabinet resonances to enhance the accuracy of our acoustic pianos. By isolating these sonic components, the RX engine allows you to create a sonic signature from showroom-shiny to road-ravaged; adding just the right amount to suit your individual taste. This attention to detail, called the RX Experience, is what makes playing the SV-1 a joy. It comes to life under your hands, with a three-dimensional sound evoking the electro-mechanical legends, reborn. The superb sound generation of the SV-1 is further enhanced with the inclusion of six separate stages of signal processing, all bypass-able. Controllable from the front panel, the EQ allows you to shape the tonal quality of your sound in real-time. This section provides the essential effects for pre-treating your sound or adding some vintage vibe, with some classic effects modeled by Korg's legendary guitar effects designers. Add a sweep pedal (i.e. Korg's EXP-2 or XVP-10) to get funky with the Wah. A wealth of amp heads and speaker cabinets are available to add color, drive and edge to your sound. Plus, Korg's exclusive Valve Reactor circuitry adds the warmth or snarl that only a real 12AX7 tube can provide. Some of the most famous stomp-box pedals have been recreated to give you the signature sounds for these legendary timbres. Korg's rotary speaker emulation has long been acclaimed as one of the best, faithfully adding nuance and motion to any organ sound. Four types of reverb are provided, along with a classic tape-echo, plus a tempo-based digital delay - complete with a tap tempo switch. This final step in the chain ensures your level remains balanced across all sounds, and is adjustable only via the included computer editor/librarian software. The user interface has been designed with performance in mind; every essential control is quickly accessible on the front panel, with no confusing menus or multiple button presses. Rotary knobs include illuminated LED's to show the position of the knob, and can be pressed to restore the original setting. For really quick changes, the SV-1 has eight car-radio style buttons to instantly call up your eight Favorite sounds and settings. Storing a Favorite is equally as easy. Simply adjust the controls to your preferred settings, then press and hold one of the Favorites buttons; when the button flashes, press it again. Your custom setting is now stored. The SV-1 is equipped with Korg's finest graded-hammer action (RH3) 88-key keyboard. The Function button provides access to eight different velocity curves that allow the keyboard to response to match any performance style. Authentic to the end, the SV-1 offers eight tuning schemes including equal, grand piano stretch, electric piano stretch, electric grand, upright stretch, detuned and two user-definable types (configurable using the editor/librarian software). Overall tuning can also be accessed via the Function button, and adjusted by using the EQ treble control. While in this mode, concert pitch (A=440) can be recalled quickly by pressing the treble encoder pot. Needless to say, the SV-1 can be transposed into any key. Housed in a bold, curvaceous body, the SV-1 really stands out from the crowd. Coupled with retro-style controls and stunning carbon gray finish with metallic copper ends, the SV-1 oozes desirability - and playability! An optional adjustable and collapsible chrome stand is available, as is a gig-ready rolling soft case. A pro 88-key keyboard would be incomplete without all the right connections. The SV-1 is equipped with balanced XLR and outputs; Left and Right audio inputs; MIDI In and MIDI out jacks, USB MIDI Port, and 3 pedal connections: Damper, Pedal 1, and Pedal 2. The Damper pedal is included, and responds to half-pedaling for authentic piano response. Pedal 1 is designed for a switch type of pedal, and can operate as a piano Sostenuto pedal, or as a Fast/Slow switch when the Rotary Speaker effect is on. Pedal 2 can accept either a sweep-type pedal - great for authentic Wah effects and accurate organ volume control - or an additional switch pedal, providing the piano purist with access to all three piano pedal functions by adding the Una Corda (soft) function. While setting out to create an incredibly friendly and easy-to-use instrument, they knew that there were more tech-savvy players out there that would love nothing more than to dig in a little deeper. The SV-1 Editor/Librarian software provides cool graphic-based programming, including access to many effect parameters not available on the SV-1's panel. In addition, the Editor/Librarian software allows each of the 36 sounds and the eight Favorites to be programmed and saved individually. This points the way to users sharing and swapping their favorite settings, and for Korg to supply more sounds in the future. The SV-1 Editor/Librarian runs on Mac or PC, and is included free with every SV-1. MIDI Local can be set on or off from the front panel, allowing the SV-1 to function effectively as an 88-key controller keyboard in any software set-up. The "S" and "V" in this keyboard's name stand for "Stage" and "Vintage", and that about sums it up. The SV1 has all the throwback sound and feel you can handle, with a ton of performance-ready features for live use. A first glance at the retro styling of this 88-key stage piano had me thinking I had stumbled into my grandparents' rec room from back in the 70s (they had an electric organ that gave the same kind of vibe). All the controls are immediately accessible from the front panel; no hunting and pecking through menu layers to make tweaks. In fact, the only thing on the SV-1 remotely resembling a display screen is the clear plastic window showing off the glow of the 12AX7 preamp tube. Korg eschews the trendy blue LEDs found in many of today's electronic instruments in favor of nostalgic amber backlighting for knob position indicators and engaged button controls. Like any pro stage board, the SV-1 is easy to integrate into a live sound rig. It has a pair of 1/4-inch unbalanced outputs and a pair of balanced XLR outputs for amp or mixer hookup, plus a stereo headphone jack for private practice. Both standard MIDI and USB MIDI connections are available for additional control options, and three pedal jacks and a pair of 1/4-inch inputs round out the I/O section. The SV-1 comes with a damper pedal. Factory sounds are accessible via the two Sound knobs; six banks with six presets each, for a total of 36 sounds to start with. It took me a while to work my way through all the presets; each one sounded so good I was reluctant to move on. The Rhodes patches were particularly tasty, along with the Wurlitzer rigs in the E Piano 2 bank. The Clavinet patches were nice and funky, though the transitions from one velocity sample to the next were a bit more apparent here than on some of the other patches. Not so much as to compromise their effectiveness in a live setting, though. The piano settings were very detailed, with some of Korg's fancy RX technology in the mix providing damper characteristics and soundboard resonance. The organ patches were nice, if a little vanilla. There are no stops to set, so you'll need to use the onboard effects to get tonal variety. EQ settings are integrated into the preset patches, but you can tweak the three-band EQ to your liking. If you stray too far, you can simply press the knobs like buttons to return to the original preset values. The SV-1 has a robust onboard effects, with separate controls for Pre and Master effects. The Pre section simulates six common stompboxes that match up well with the preset tones. Boost, Compression, Vibrato, and Tremolo are pretty straightforward, but I really liked the U-Vibe, patterned after the ubiquitous UniVibe pedal. To my ears, the U-Vibe sounded kind of like a cross between a rotary speaker simulator and a phase shifter. The Wah effect was also very usable, and can be configured as a velocity-sensitive auto-wah, or standard pedal-style wah. The Master Effects section contains a variety of modulation effects such as chorus, phaser, flanger and rotary speaker simulator with dedicated Speed and Intensity controls (the rotary simulator has a separate button for fast/slow speed adjustment). Reverb and delay are also available from the master effects, with a depth control and a tap tempo button to match the effect to your playing. I really liked the smooth, tailing reverb settings, and the phasers were spot-on as well. All of this gets passed to the Amp Model section, with six amp variations to chose from. The Drive knob couples the amp modeling to the onboard preamp tube, adding bubbly warmth and a nice dirty bite to the tone. The electric piano patches really came to life for me when I jumped on the low-register keys in bunches. The EQ, Pre FX, Amp Model, Modulation FX, and Reverb/Delay sections all have individual on/off buttons, offering further tonal variation. Once you've dialed in a tasty combination of base sound, EQ, effects, and amp modeling, you can store it all in one of the eight Favorites buttons in the middle of the front panel. There are no complicated menus to page through, just press and hold one of the favorites buttons until it blinks, then press it again and you're done. The immediacy of all the controls on the SV-1 were really impressive, and are a major time saver up on stage. One-button transposition and variable tuning and touch response (velocity, not pressure) curves are great for being able to roll with the changes at a live gig. The hands-on access is a big plus, but you mega-tweakers out there may be looking for some additional editing options. Never fear, the onboard USB port can be used to access the included editor/librarian software, letting you go deeper. If you've got more settings to save than the eight Favorites buttons on the SV-1, you san store the extras to computer and pre-load the keyboard with whichever eight you'll need for the next gig. You can even override the initial 36 presets with your own custom sounds, effectively putting 44 of your favorite tones within easy reach. You can also use the editor software to modify the center frequency for the midrange EQ knob, access additional effects parameters, or set up a unique touch response for each sound. Korg plans to release new sound banks for the SV-1 at some point in the future, and you'll be able to load them in through the software. This review has been selected by our experts as particularly helpful. "The Best Keyboard"
Sound: The keybed is the best. the keys don't go side to side. The keys are solid and the touch is perfect back pressure, not too hard and not too soft. I save 8 favorite sounds I came up with and I recall them with a touch of a button. The electric sounds are great. the straight piano is OK, I don't mind it. But i play a Steinway D with 20 velocity layers on my computer with the keyboard when i want to best possible piano sound available to piano keyboardists. . Feature: 8 touch buttons for your favorite sounds. The Shell is metal and solid. The design is awe inspiring. The knobs and their lights are the latest high tech. I just site down and play a piano sound. I don't have to search and look for a horn sound or a harmonica sound or whatever. That is the Kronos. My setup is in many respects better than the Kronos. I have my computer running cubase and work it in conjunction with the keyboard. I have notes on songs in word. Different set lists. I can do as much or more than a Kronos. Ease of Use: No learning curve. Just experiment with the sound knobs. Nice having a music stand. and the damper pedal (A1 quality) comes with it. Hooked up to a computer you can't get much better. And the price for that quality.... 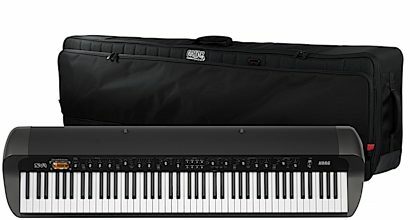 I have owned many keyboards and tried most keyboards and I couldn't come up with better than the Korg SV-1 Quality: The keybed is built to band on. I band on it when i do rock and roll songs that require that energy. The keys are solid and there is weight to them. You can tell when you pick the keyboard up. Value: This is the best value among all the keyboards. I didn't like the looks at first because it looked like a synth with all the knobs. But when you understand the knobs and play it you are hooked. Manufacturer Support: I dealt with Korg before on a cheaper keyboard and they were fabulous. I had to wait about 20 minutes in line but that is normal. The Wow Factor: People know you have a quality keyboard. They ask how much did it cost so it looks expensive. You have to play good to live up to having this keyboard. Overall: First let me say the Zzounds was spectacular. Right after i ordered the keyboard the next day 12 mo financing came out. I had 8 mo financing. I called and they said call FedEx and tell them to send it back. So I did. Then Zzounds let me buy with 12 mo financing. Spectacular. They said it had to be returned first before they could switch the financing. That was so nice of them. Now i have an extra $100 a month to buy more music equipment. "Honest Tone, Amazing Feel. " Overall: I've been a zZounds customer for years, and I simply had to let my very first review be on this product... I've had my Korg SV-1 for a few days now, and I am completely blown away. Firstly, the packaging Korg sent this in was pristine. In the past, zZounds has sent me many defective products, mostly due to inferior packaging, but Korg has done an excellent job in getting the product to me in perfect shape. Secondly, the analog look, feel, and sound of this keyboard are collectively enveloping in the most beautiful of ways. The RH3 keybed is what I was most excited about, as its feel is simply incredible compared to every single model in the $1,000-$3,000 price range. And let's be honest, you're looking at this keyboard because you do not want to have to deal with an algorithm driven computer based synthesizer platform that requires a heavy amount of learning and tampering with in order to get the sound that you're looking for, especially on the fly. The SV-1 sounds radiant and true right out of the box with it's electric pianos, acoustics, organs, etc. It houses the "most wanted" of keyboard tones, which have completely surpassed my expectations in how they would really sound. Believe me, you won't be disappointed. And hey, if by some off-chance you are, then you can just send it back without a hassle (another reason I frequently use zZounds). That's pretty much what you wanted to know, right? Looking for any negative issues? Then definitely check out the other reviews, but I'm extremely happy with my purchase overall and will be for years to come. Thanks zZounds! Style of Music: Jazz, Blues, Rock, Latin, Etc.